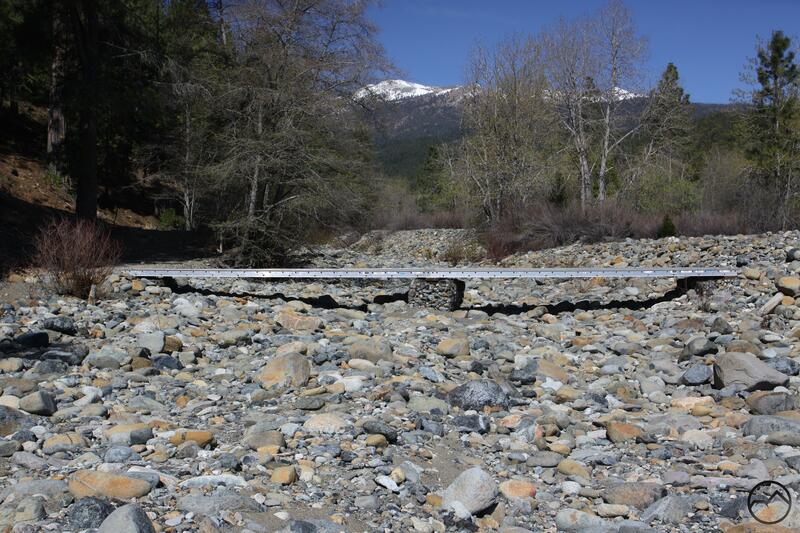 The fact that the Lake Siskiyou Trail had been washed out at the lake’s inlet came as a surprise. I planned on taking my kids to the bridges and letting them spend time throwing rocks and sticks in the river and generally enjoying a morning with the river. While they did enjoy the intended activities, we made it no further than the north shore of the Sacramento River. As it reached the lake, the river ran deep and swift and attempting a crossing was not an option with two little kids. However, once I had ascertained what had happened, I was extremely curious to determine the condition of the seasonal bridge that crossed over the river’s main south channel. 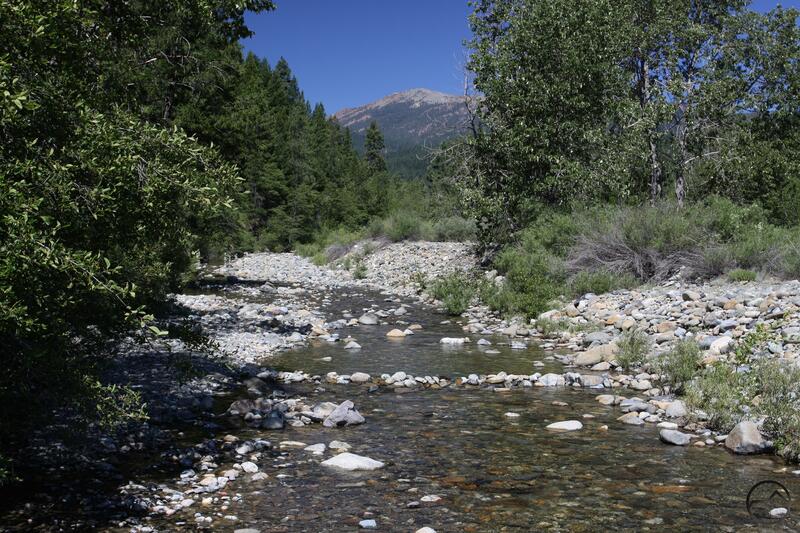 Upstream from the waters of Lake Siskiyou, the river splits into two primary channels. The seasonal bridges are installed to cross over both of these channels. Not being able to cross the north channel at the time, I knew that investigation would have to wait for a later date. Today, I had the opportunity to make the shore hike down to the river from the southern approach. What I found completely defied my expectations. Rather than an area similarly washed out like the Sacramento’s north channel, I found the bridge intact. However, the channel through which the river normally flows was completely dry. This was shocking considering that the south channel had always seemed to be the primary course of the river, usually containing more water than the branch to the north (click here to see the channel with water flowing through it, albeit later in the year when volume is low). Not only was the bridge and channel intact, but the Lake Siskiyou Trail was untouched by whatever massive flood had devastated the bridges and section of the trail a few hundred yards to the north. The surprisingly intact seasonal bridge. The bridge spans the mysteriously dry south channel. The Lake Siskiyou Trail remains intact. The new primary channel flows past the site of the washed out bridge. 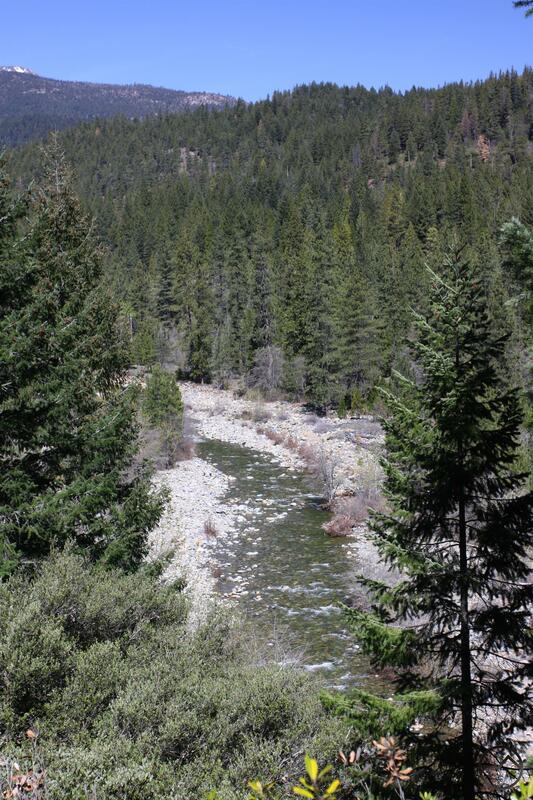 I walked across the bridge and followed the trail over to the site of the northern crossing. As it had the day before, the Sacramento was running swift and deep, carving a new channel out of a broad expanse of river rock and sediment. On the first visit, the landscape had changed so much that it was hard to even guess where exactly the bridge had been located. This time it was possible to follow the trail right to the old crossing. Of course, the wire cages full of rock that had anchored the bridge were gone, as was any other trace that the aluminum span had been there. It was now evident that the southern branch of the river had somehow been stopped up and the full volume of the Sacramento was now being funneled through the north channel. I returned to the dry southern channel, intending to follow it upstream and find the blockage that had caused the river to radically alter its course. Surprisingly, about 70 or 80 yards beyond the seasonal bridge, I found that water still flowed through the rocky channel. The volume was not great and the water disappeared beneath the rocks before reaching the seasonal bridge. I was equally surprised (though by this point I should not have been) to find that the water did not directly connect to the river but instead followed a subterranean course and emerged from the rocky channel a bit downstream from what turned out to be the old, now defunct split in the river. Surprising water flowing through the south channel. The water emerges from the rocks below the dry south channel. 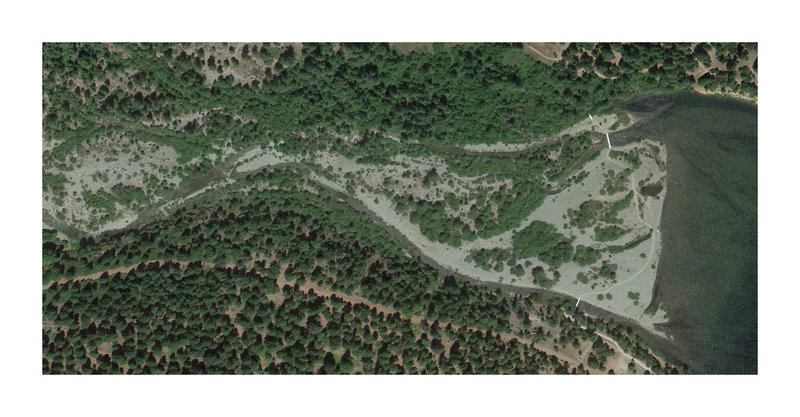 The former fork in the Sacramento, where the river was divided into northern and southern branches also revealed more surprises. I was expecting to find a large log jam or other obstruction that had forced the water to abandon the southern branch and to overwhelm the northern channel. 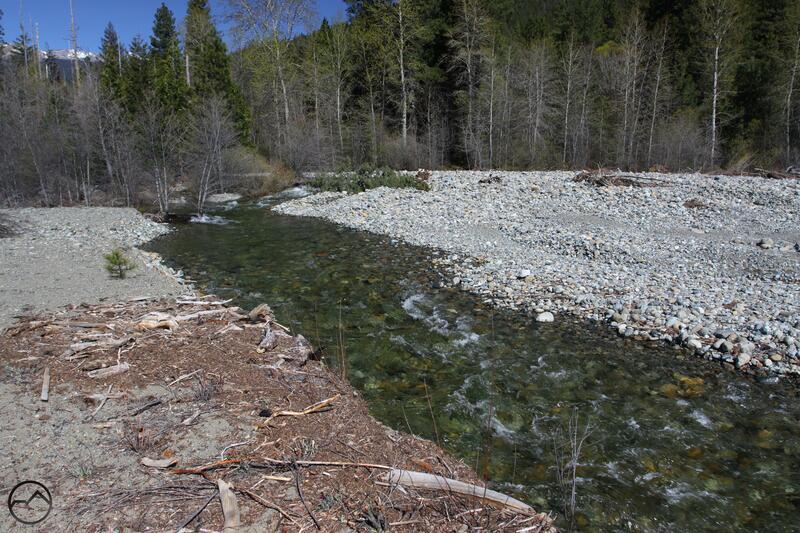 Instead, any evidence that the river had split at the site was seemingly erased. The water flowed swiftly through a rocky channel, surging into the northern channel with no opportunity to divert into the southern channel. Where I had expected the log obstruction I found only a low, embankment composed of a vast pile of multicolored river rock. This was somewhat anti-climactic given the destruction the plugging of the southern channel had wrought at the inlet. However, what caused it was certainly mysterious. The river runs alongside the rock embankment where the split was located. It may be difficult to visualize what has occurred. I prepared a few more maps to help illustrate what I have discovered. The first two maps show the area in 2012 when the water level was high and in 2014, when the drought had taken its toll on the river’s flow. Note the heavy flow through the southern channel. 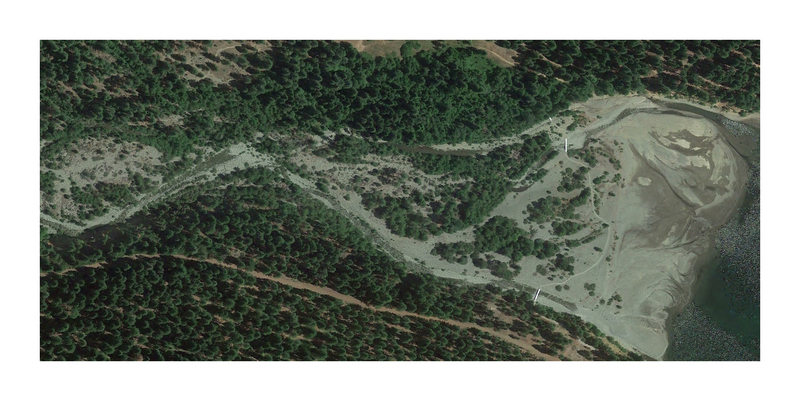 The Sacramento River and Lake Siskiyou in 2014. The southern channel, though reduced, still retains good flow. Though this is speculation, I think that the initial obstruction of the south channel occurred earlier in the year, during one of the torrential rainstorms that we had. With the seasonal bridges removed, the result of the southern branch’s obstruction would not have been obvious. The drought then took hold and the river’s flow reduced enough for the seasonal bridges to be installed. Then the snow fell and began to melt. This increased the river’s flow and it was all funneled into the northern channel. This then wiped out the bridges across the north branch of the river. Whatever the order of events, seeing the Sacramento River change its course in such a short amount of time is humbling. Even in this drought ravaged season the river is able to summon up enough strength to alter the landscape dramatically. If nothing else, we should take note of the power inherent in earth in upheaval. Great report, Bubba. Pretty amazing the way the river decided to ‘obsolete’ the seasonal bridge – not something we’d expect in a drought year. Descriptive photos with excellent writing – thanks, keep up the good work!